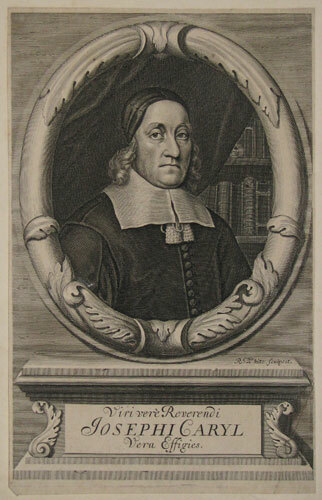 Joseph Caryl (1602-1673) was born in London in 1602, and was educated in Exeter college, Oxford. In 1627 he took his degree in arts; and entering into holy orders, he exercised his function for some time in and about Oxford. After this he became preacher to the honorable society of Lincolnshire, where he continued for several years, and acquired a good reputation. In 1642 and afterwards, Mr. Caryl was frequently called to preach before the Long Parliament; and being now become conspicuous and eminently distinguished for his abilities and Puritanical principles, he was chosen a member of the Westminster Assembly of Divines; in which, as in every other station, he evinced much learning, piety, and moderation. About this time he was also appointed licenser to the theological department of the press. In 1645 he became pastor to the church of Magnus near London bridge; in which situation he labored several years with great diligence and remarkable success. He was considered one of the best expositors of Scripture in that period, and an excellent and very empathetic preacher of the gospel. He was appointed, along with Mr. Stephen Marshall, as chaplain to the commissioners who were sent by Parliament to the king at Newcastle, to negotiate an accommodation of their differences. In September 1648, Mr. Caryl was one of those divines who accompanied the commissioners of parliament to the Isle of Wight to negotiate a treaty of peace. In September 1650, Mr. Caryl and Dr. John Owen were appointed by Parliament to travel to Scotland to attend Oliver Cromwell, who desired their company and service. In 1653 he was appointed one of the triers for the approbation of ministers to fill the vacant churches, and the following year he was constituted an assistant to the commissioners for ejecting scandalous, ignorant, and otherwise insufficient ministers and schoolmasters. After his ejection, Mr. Caryl continued to live in London, and soon gathered a congregation in the vicinity of London Bridge, to whom he preached as the times would permit. His congregation increased so much that at the time of his death eleven years after his expulsion, he left one hundred and thirty-six communicants. He died at his house in Bury Street, London, universally lamented, in February 1673, and in the seventy-first year of his age. or, The Punishment of the Sword a Judgment From Heaven. A sermon on Job 19:29. Contains extracts from Caryl’s Exposition on the Book of Job. Edited by John Berrie in 1824. Covers Job 1-14. Pithy quotes on various topics extracted from Caryl’s commentaries on the book of Job. Want to discuss something pertaining to Joseph Caryl? Leave a public comment below (subject to moderation), or send a private message to the webmaster.